In a recent post surveying the exploding contemporary art landscape, we threw out a few scenarios by which a museum can stumble upon this highly valuable and in-demand asset. Scenario number one: A private collector donates the work. Clean and easy. Scenario two: The art ends up at a museum, but there's a catch. It's a museum built by the actual collector. We then posited a third and more Faustian alternative: A donor willing to contribute highly valuable art but with massive strings attached such that it may compromise the integrity of the museum. News out of Miami points to yet a fourth variant on this rather pleasant thought exercise: A museum nets art from a private collection with assistance from a foundation acting as a third-party broker. 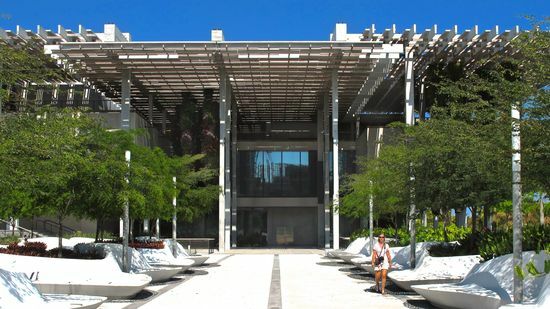 Pérez Art Museum Miami (PAMM) announced its major of over 400 language-based artworks from the world-renowned Miami-based collection of Ruth and Marvin Sackner. The acquisition is a combined gift and purchase made possible thanks to the "generosity" of the John S. and James L. Knight Foundation and Marvin Sackner and his late beloved wife Ruth of 59 years, co-founder of the Sackner Archive of Concrete and Visual Poetry, which is the largest of its kind in the world. The museum will receive the contents of PAMM’s well-regarded 2013 exhibition, A Human Document, which was part of the museum's inaugural exhibition series. Additionally, PAMM curatorial staff selected another 150 pieces representative of the collection’s breadth and historical importance. A new exhibition celebrating this milestone is currently scheduled for June 2017. So what was Knight's role in this transaction? In addition to that quote regarding Knight's generosity, we have this nugget from PAMM Director Franklin Sirmans: "The acquisition, thanks to our collaborators at Knight Foundation, further elevates PAMM as a requisite destination for art and scholarship, not just in Miami, but in the world." Indeed, it seems as if Knight was a middleman in the truest sense. When Ruth Sackner passed away approximately one year ago, the Miami Herald turned to her good friend and Knight Foundation CEO Alberto Ibargüen. It sounds like Ibargüen and the Sackners had a close personal relationship. "I can't remember seeing one without the other," he said. "They collected together, they presented together, they did everything together. It was an equal partnership." Knight's relationship with PAMM, meanwhile, is deep and wide. In our analysis of Knight's 2015's South Florida spending spree, we mentioned that PAMM netted a cool $5 million. What's more, the Sackner gift comes on the heels of the museum's announcement of more than 100 new acquisitions back in May. Guess which grantmaker played an integral role in securing some of these pieces? You only get three guesses.